Houses & Homes VA: A Blast from the Past! Do you remember this toy? Well, maybe it wasn’t so much a toy as it was a project but it was loads of fun! 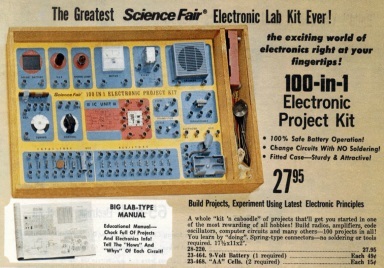 I suspect that maybe this interested boys more than girls but I’m sure that many of us little ladies also had fun with this exciting and interesting kit, even if it was our brother’s! Most of us that had one of these when we were little probably forgot all about it by now but I think this type of gift is much more interesting (and educational) than just about anything we can buy today. Gone are the days of visiting the local Radio Shack with dad on Saturday to buy a new tube for our broken TV but the memories still remain. If you would like to buy something similar today there is a company called Elenco that offers these types of kits to educate children in the field of electronics. They have a huge variety of other educational products as well and in my opinion there is something here to please and child and provide hours of fun learning.